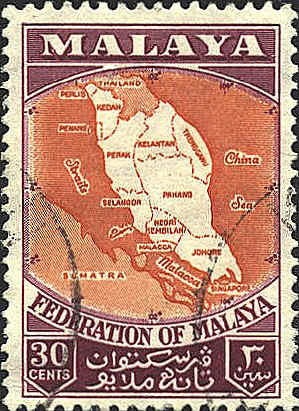 Malaya joined the states of Pahang, Negri Sembilan, Selangor, Perak, Kedah, Perlis, Kelantan and Trengganu and the settlements of Penang and Malacca in 1963 to form the Federation of Malaya. It was a sovereign state in the British Commonwealth. 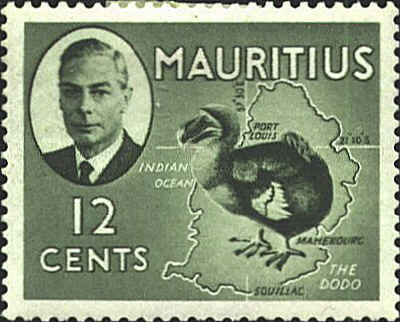 The stamp was issued in 1957 and shows a map of the Federation. The Isle of Man is located in the Irish Sea of the Northwest coast of England. From the 9th to the 13th century , when it was ceded to Scotland, it was part of the Norwegian Kingdom. In 1765 to Britain, where it remains semi-autonomous within the Commonwealth. The stamp, issued in 1980, shows silhouette maps of Norway and the Isle of Man, and celebrates the connection between the two, by marking the visit of King Olaf in 1979 and the Norwex 80 stamp exhibitrion in Oslo in 1980. Mauritius was a British Crown colony until is was granteed self-government in 1967 and became an independent state in 1968. The stamp was issued in 1950. Although the latitude and longitude are incorrect (20° 10'S, 51° 30'E) the correction (20° 17'S, 51° 33'E) was not made until the coronation issue in 1954.